To reduce the complexity and time spent in building life cycle plans, project managers often reuse process assets from past projects. Such impromptu reuse is risky when the assets being reused were not created with strategies that make it reusable. 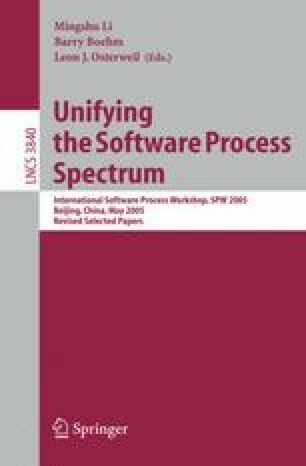 In elaborating Osterweil’s “Software Processes are Software Too” insight, Boehm et al have expressed the duality between software products and processes as: “If a given approach is good for software products, then its process counterpart is good for software processes.” In this paper we discuss the duality between product and process reuse. We propose the development of process elements, “process counterparts to software components,” which can be built with reusable strategies. These process elements can then be integrated with other process elements to develop software plans. We also present the results of an experiment that was conducted on several projects using our approach.